3.5mm to 2.5mm mono hands-free cable - used for hands-free connections with cordless and cellular telephones with a mono 2.5mm jack (phone may have an optional 2.5mm mono adapter if the jack is not built-in). Also, certain corded phones that have 2.5mm hands-free jacks like the new ClearSounds CSC600 will be able to use the neckloop with this cord. 3.5mm to 2.5mm stereo hands-free cable - used with newer cellular phones that have stereo 2.5mm jacks (phone may have an optional 2.5mm stereo adapter if the jack is not built-in). 3.5mm to 3.5mm mono audio cable - used with corded phones that provide a 3.5mm mono jack for connection to neckloops and headsets. 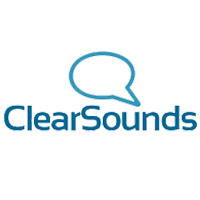 This same cable can be used with most personal listening systems like the ClearSounds SoundWizard. 3.5mm to 3.5mm stereo audio cable - used with most audio devices that use stereo connectors for their headsets such as iPods, MP3 players, radios, etc. Package Contains: Base, 2 AAA Batteries, 4 Connection Cables and User Manual.